I know, I know, the last tour I reviewed was a Victorian architecture walk, but what can I say? I enjoyed that one, still have a lot to learn, and was just curious how some of the others might stack up. You assemble in Union Square and are “transported” (more about that later) to the corner of Sutter and Octavia. After a short history of the building, you get several minutes to scramble around the venerable (and haunted!) 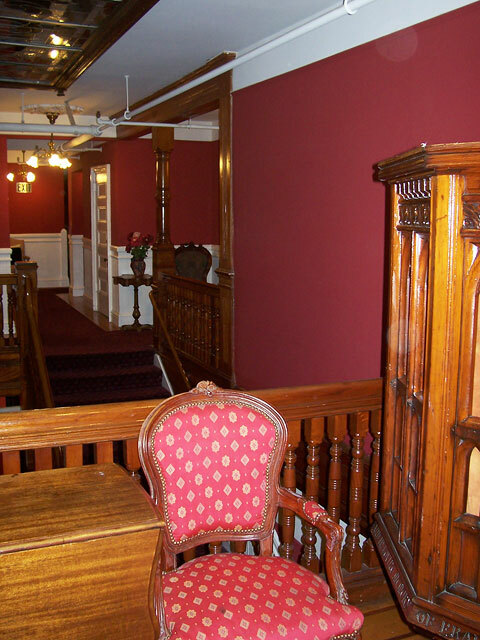 interior of the Queen Anne Hotel. 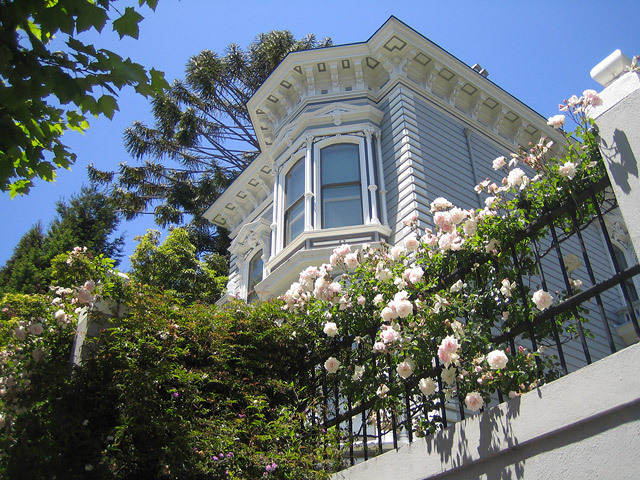 The remainder of the tour consists of a gently-paced walk through Pacific Heights, organized around learning the characteristics of the three major styles of Victorian-era homes. The walk is not a loop, as many others are, but ends up at the corner of Steiner and Broadway, across the street from the famous “Mrs. Doubtfire” house at 2640 Steiner Street. 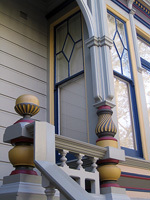 “Victorian Home Walks” was launched by Victorian-owner Jay Gifford after being “downsized” from a job in the computer industry in 1993. Our guide (Shonna Sinclair) has been leading the tours for almost a decade, and it showed; she was patient, knowledgeable and extremely generous with stories and information. And once she outed herself as the kind of person who likes to spent her free time digging through old census records, I was on board! It’s a little embarrassing, but I don’t know a Queen Anne from an Eastlake-Stick. 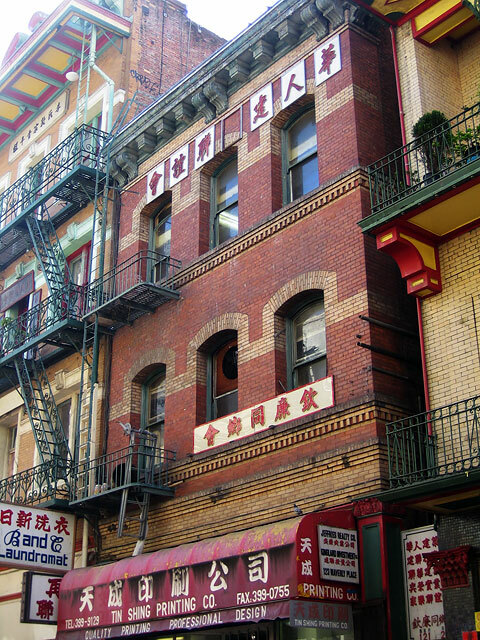 Despite having lived all over San Francisco, I just never got around to learning anything about the architectural style that defines this city: Victorian. 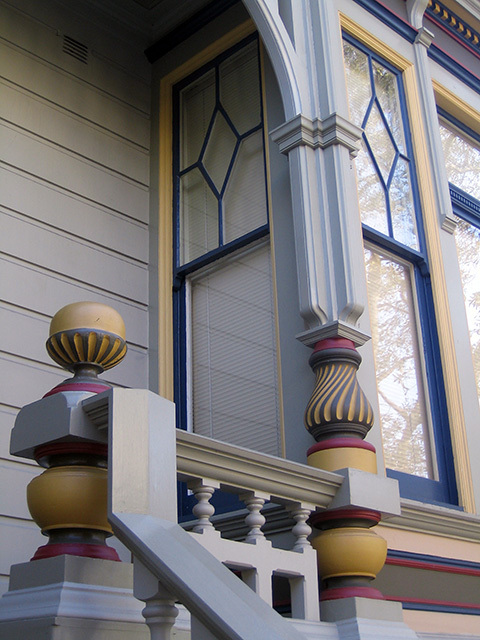 That’s what attracted me to the “Pacific Heights Walking Tour” offered by San Francisco Architectural Heritage. Pacific Heights is a neighborhood that I haven’t focused on, historically speaking, so I hoped to learn a little something, and yes — pick up a story idea or two. This tour seemed like a great place to start — San Francisco Architectural Heritage is a non-profit organization which (according to their website) “encourages appreciation of the built environment and understanding of the value of preserving significant San Francisco architecture.” You may already be familiar with their headquarters, the gorgeous Haas-Lilienthal House on Franklin Street which also serves as a Victorian house-museum. Tours of the House itself are also on offer, which I will certainly take advantage of at some point in the future. I was a bit early, and Vikki, our guide, made an excellent first impression by inviting me to wait in the garden and directing me to the best-smelling rosebush in the place! She began with an inspection of the mansion’s exterior and a potted history of the Haas-Lilienthal family. I lost track of who was who almost instantly, I’m afraid, but this turned out to be perfectly okay — the cavalcade of building facades and associated stories to follow provided information enough to keep everyone interested. 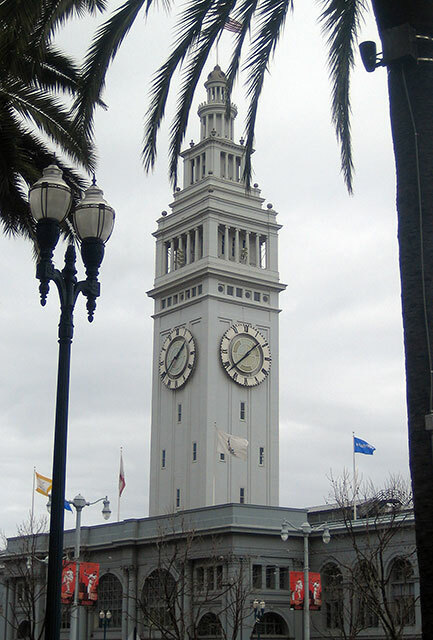 First of all, let’s hear it for the San Francisco City Guides! 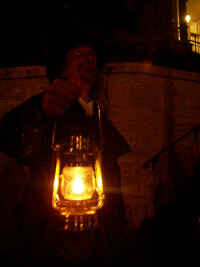 A wonderful bunch of volunteers, dedicated to tramping around this fine city and sharing their knowledge with you. 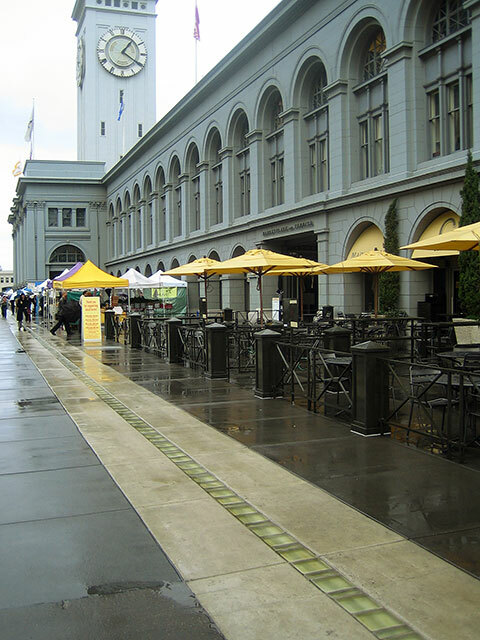 They’re a non-profit organization with more than 200 trained volunteers leading dozens of history and architectural walking tours, sponsored by the San Francisco Public Library. Visit their website to learn more about their offerings. Sooner or later I’ll be taking every single one. 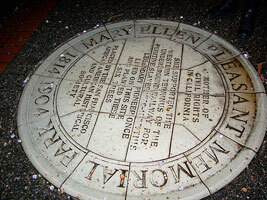 Todays tour was one established especially for the Earthquake centennial year of 2006. 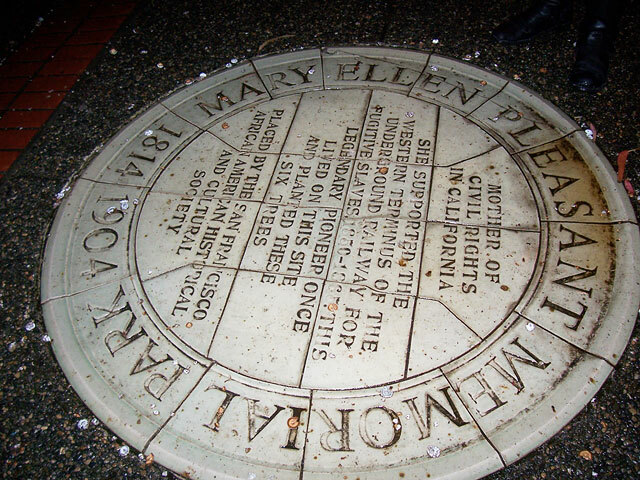 It hits some of the high points of that fateful period, from famously corrupt city officials to details and lore of the fire itself. The point of this walk is to acquaint the casually interested tourist with the time period of the quake, some of the more famous characters, and with the general environs. And in this it succeeds. An enormous amount of ink and pixels has been spilled over this tour, and deservedly so. 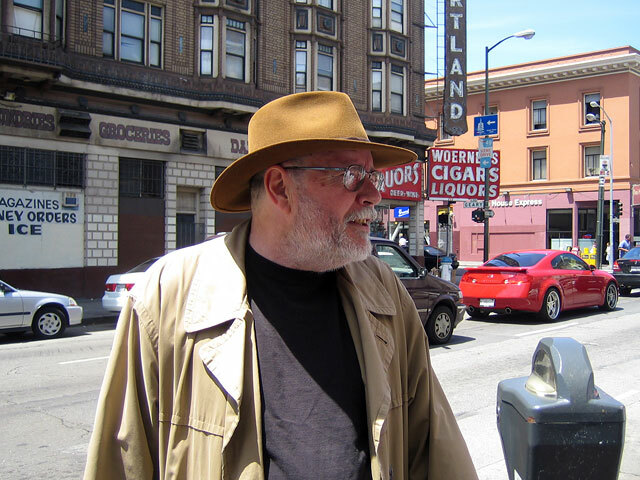 Don Herron has been showing up with a brimmed hat and trenchcoat for over a quarter century now, leading groups of tourists and locals alike through the gutters and over the hills of Dash Hammett’s 1920’s San Francisco. Famous? The man’s even been the subject of a Jeopardy question! (Answer: “The city in which Don Herron leads a Dashiell Hammett tour”). We met on the sidewalk in front of the Main Library, and as the group assembled, Don’s introductory lecture began. It lasted half an hour, and that was just the beginning. This tour is not something to be entered into lightly — it’s a marathon. Herron’s mastery of the subject is encyclopedic, and he is absolutely committed to giving you your $10 worth — as we hiked, the biographical information and trivia came so thick and fast that my notebook pages began to scorch and wilt under the assault.